The Video Electronics Standards Association (VESA) recently introduced its DisplayHDR certification program to help consumers quickly discern between good, better and best 4K Ultra HD LED-LCD PC monitors with high dynamic range (HDR) capability, but member executives would like to see it applied more broadly. 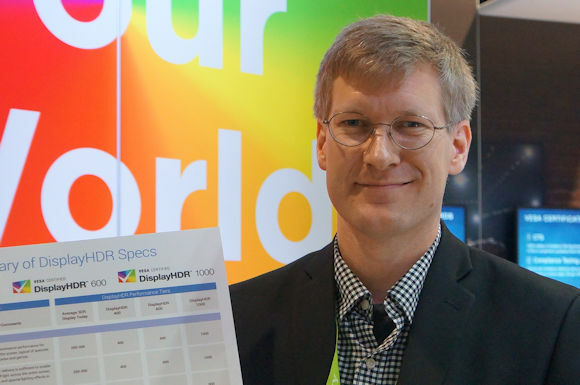 Roland Wooster, Intel Desktop Products Group platform innovation manager and VESA representative, told us that selling HDR-capable displays is breaking new ground and the DisplayHDR certification criteria his group developed provides a road map for consumers navigating the technology landscape. Last fall, the VESA released its three-tier certification program that identifies and classifies 4K/HDR LED-LCD PC monitors and laptop screens in a classic good, better, best approach. The program is applicable and available to all forms of video display devices including television sets, but so far most in the consumer electronics industry have opted to stand behind the Ultra HD Alliance’s (UHDA’s) Ultra HD Premium program, which establishes criteria for one level of display performance for two separate display technologies — premium LED-LCD TVs and OLED TVs. The UHDA is not interested in expanding its premium program to more classification levels at this time, leaving the door open for videophiles and product reviewers to leveage the VESA program to help define performance levels of consumer HDR-capable 4K Ultra HD LED-LCD TVs for themselves. “The mathematics of exactly how you create every test file is now public,” Wooster said. As previously reported here, the VESA certified HDR Display program breaks out three classifications of HDR monitors by a number that represents the minimum level of peak luminance in nits — DisplayHDR 400, DisplayHDR 600 and DisplayHDR 1000. This includes measuring peak luminance for both powered delivery in brief 2 second bursts and long-duration in 30 minute intervals. The tests use both 10% white window “patches” and full screen. Wooster said this is particularly important for content creators. In addition to luminance testing, DisplayHDR certification uses two different tests for black level. One uses a corner box test, which tests for local dimming capability. The other is a tunnel test that tests for native level contrast. The DisplayHDR program also specifies uses and performance levels for local or global dimming systems. The DispalyHDR 400 spec. calls for global dimming but doesn’t require local dimming. The 600 level, based on current LCD technology, requires local dimming. The specifications all require a minimum of hardware-based 8-bit panels, steping up to 8-bit plus 2-bit dithering. “What most people won’t tell you is that in the current display industry, especially for the PC industry, most panels, around 85%, are 6 bit. Most people who claim to have 8-bit panels are actually using 6 bit hardware plus 2-bit dithering. We have set an absolute hard requirement for true 8 bit hardware and because the dithering is extremely inexpensive to add, we expect that it’s usually going to be 8 bit plus 2-bit dithering on top of it. The 8 plus 2 requirement is a hard requirement of the 600 and 1000 specifications. This assures the display will present smooth gradations of color with minimal banding,” Wooster said. “The other thing we’ve added is the transition speed from black to white. If you have local dimming or global dimming, it takes some time to get from black to white. So we’ve added some specific measurement requirements around the transition speed at which the display can elevate to full luminance level. We’ve added some criteria that’s pretty tight,” he continued. VESA is also preparing to release this quarter an automated test tool it is developing in association with Portrait Displays SpectraCal, the developer of CalMan. In other efforts, VESA is tightening up the DisplayPort 1.4 cable spec. for the raw transport performance augmented with a PC to ensure the best enduser experience. In addition, VESA is in the process of updating DisplayPort spec. for a next-generation that will increase the data rate of DisplayPort 1.4 at least two times. Today, in combination with DSC compression, DisplayPort can do 8K/60 Hz, but the next generation will enable 10K or 4K/120 Hz with a very high refresh rate. Using DP Alt Mode, the standard will accommodate 8K/60 Hz concurrent with USB-C data for very wide coverage.